Yarn: Rambouillet (possibly with mohair?) from Judith MacKenzie, dyed by me at Madrona in 2007! Notes: A very fast project due to the large gauge. 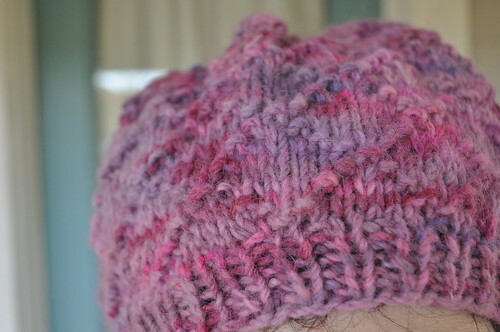 I didn't swatch and I think my short, wide stitches made this cap a little shallower and looser than I would have liked. It's for donation so I think it will find a good home nonetheless. 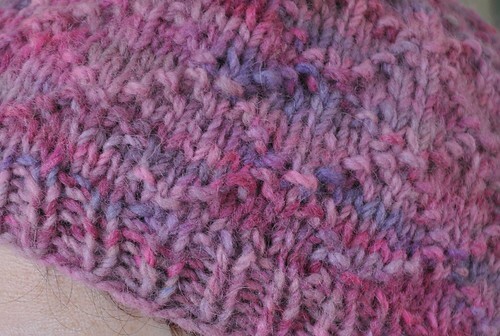 If I were to knit it again I would make the ribbing deeper, maybe 2" instead of just 3/4". I'm home sick today so I'm hiding my face!